When the name Garmin is presented, what comes across your mind? Most of us would think that a GPS navigation system will be the topic here, but not for today. 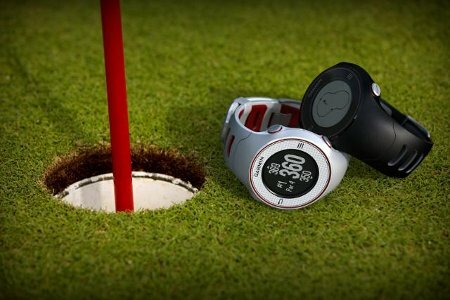 No sir, Garmin has something different in store for you – which is actually the new Approach S3 Touchscreen GPS Golf Watch. As the name suggests, this is one timepiece that deserves to see action whenever you are ready to tee off. Since golf is not only about lowering the number of strokes each time you play but will also touch on the issue of style, you can be sure that no one is going to question your fashion sense when you strap the Approach S3 around your wrist. After all, it has been described to be stylish, coming in a rugged and waterproof form factor. This high-resolution glove-friendly touchscreen device will also be pre-loaded with 27,000 worldwide courses to begin with – and more information on newer courses will be added in the long run, where you need not fork out additional subscriptions or fees. If you want, you can wear the Approach S3 as a day to day timepiece, and whenever you are ready to tee off, you can then take advantage of its features such as Green View with manual pin positioning, distances to doglegs and layup points, customizable yardage points and digital scorecards. This would mean golfers will be able to have a “virtual” caddie with them just about every stroke, without having to fork out money to hire one. Even better still, these virtual caddies will not come with any emotional baggage unlike regular caddies, which is always a good thing as emotions can always cloud one’s perception. The well heeled traveler who loves golfing around the world ought to find the Garmin Approach S3 Touchscreen GPS Golf Watch to be an essential item whenever they travel, since it will deliver free course updates throughout the year which will offer information on not only new courses, but enhancements to the current lineup as well. Out later this month, the new Approach S3 is tipped to retail for $349.99 apiece.